Pre-prep (Fill in the Blanks) - Five days: The pre-prep course comprises of fill in the blanks on all the 19 chapters of the PRINCE2® manual 'Managing Successful Projects with PRINCE2'. It introduces the PRINCE2 concepts and terminology to the delegates. It also introduces to the delegates the four aspects of PRINCE2: principles, themes, processes, and tailoring PRINCE2. Study guides - Thirty Five days: Explain the principles, themes, processes and other syllabus areas of PRINCE2 from "Managing Successful Projects with PRINCE2". Chapter tests - Twenty days: The Chapter Tests assess the delegate's degree of understanding of the respective chapter content. PeopleCert Sample Test : The sample tests provided by PeopleCert give the delegates a feel of the actual PRINCE2 exam and help them to decide whether they are ready to take the PRINCE2 exam. Study the PRINCE2 Manual: Before you start the PROJstudy PRINCE2 online course, it is strongly recommended to go through the PRINCE2 Manual and understand the basic themes, processes and Principles used as per the PRINCE2 methodology. Study the Chapter guides available at PROJstudy.com: For a thorough understanding of the PRINCE2 concepts, themes, processes and principles, study exclusive PROJstudy study guides. Take the Chapter Tests for each chapter: For helping the delegates to practice what they have studied through the PROJstudy study guides and PRINCE2 Manual. Our online courses include chapter tests which examine the delegate's understanding of PRINCE2 concepts and reinforce the same through extensive justifications. Take a full length sample test from PeopleCert: To get a feel of the actual PRINCE2 Foundation exam, take the PeopleCert's full length sample tests as part of our online courses and assess your responses with the provided answers to the same. 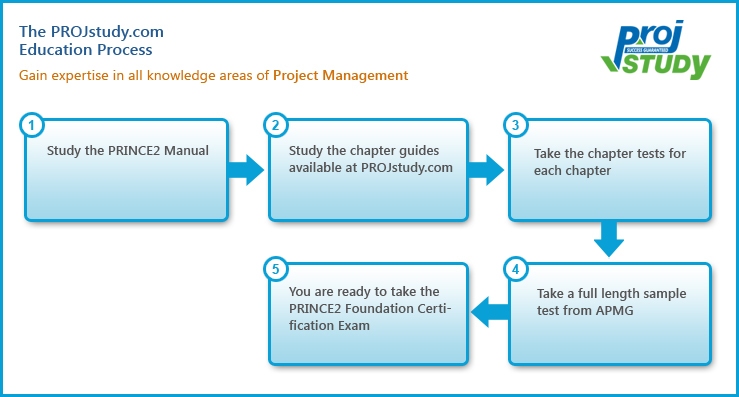 You are ready to take the PRINCE2 Foundation Certification Exam.